Prime Minister General Thein Sein inspected Biluchaung No. 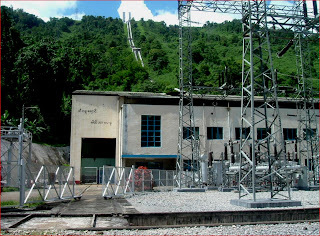 3 Hydropower Project being implemented by Ministry of Electric Power No. 1 on 10 February morning. Accompanied by Maj-Gen Min Aung Hlaing of the Ministry of Defence, Chairman of Shan State Peace and Development Council Commander of Eastern Command Brig-Gen Yar Pyae, ministers, deputy ministers, Chairman of Kayah State PDC Brig-Gen Win Myint, the director-general of the Government Office and departmental heads, the Prime Minister left Loikaw by helicopter and arrived at Lawpita Village where they were welcomed by departmental officials of Hydropower Generating Enterprise. At the construction site of Biluchaung No. 3 Hydropower Project, the Prime Minister heard reports on implementation of Biluchaung hydropower projects and progress of Biluchaung No. 3 Hydropower Project presented by Minister for Electric Power No. 1 Col Zaw Min. The Managing Director of Future Power Co Ltd reported on undertaking of six main tasks of the project, use of heavy machinery and strength of workers. After hearing the reports, the Prime Minister gave instructions on implementation of the project meeting the set standard, timely completion of the tasks, supply of heavy machinery to the worksite and attention to be paid to worksite safety. The Prime Minister viewed the sample stones taken out from the water intake tunnel by drilling machine displayed near the briefing hall. At the construction site of the approach tunnel No. 2, the Prime Minister looked into placing of shot concrete at the walls of the tunnel and gave necessary instructions. Biluchaung No. 3 Hydropower Project site is located at the confluence of Bilu Creek and Pun Creek, 16 miles southeast of Loikaw. It has an RC ogee type diversion weir and the water intake tunnel. On completion, the power plant installed with two 24-megawatt generators will generate 334 million kilowatt hours on average yearly. At Biluchaung No. 2 Hydropower Plant, the Prime Minister and party were welcomed by Managing Director U Kyi Tha of Hydropower Generating Enterprise and staff. The Prime Minister viewed generating of turbines at the control room. You are currently browsing the archives for the ဘီလူးေခ်ာင္း(၂) (Baluchaung-2) category.